A pop song recreated and sung by Jonita Gandhi and Ash King featuring them in song video. The video of this song is available on YouTube at the official channel Strumm Sound. This video is of 5 minutes 01 seconds duration. 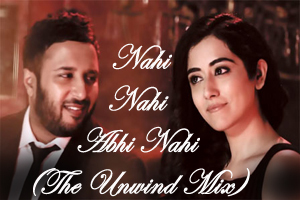 Lyrics of "Nahi Nahi Abhi Nahi (The Unwind Mix)"
Lyrics in Hindi (Unicode) of "नहीं नहीं अभी नहीं"